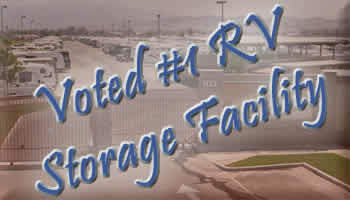 McBride’s RV Storage Was Voted The #1 RV Storage Facility in California! According to the California RV Storage Association, McBride’s is now an award winning RV and boat storage facility. Here’s what you should know about this vehicle storage facility. The best and most affordable RV and boat storage is McBride’s. This family owned and operated vehicle storage facility is dedicated to provide the best 5 star quality vehicle and truck storage facility. Over 3500 RV owners have already made McBride’s their first choice for RV Parking. You will not find another storage facility that offers the same great amenities, services, and facility features that caters to the needs of RV and boat users. McBride’s RV and boat Storage provides spacious RV parking and trailer storage for all types of RV’s. McBride’s also specializes in commercial vehicle storage and truck storage. While some facilities offer indoor RV storage or private boat storage units, McBride’s offers more options like covered or open RV parking spaces, thus making storage affordable for every household. McBride’s is especially designed to accommodate vehicle storage for the following: motorhome, camping trailer, toyhauler trailers, cargo trailers, cars, campers, trucks, boats, jet ski’s or sea doo, off-road vehicle, limousine, party buses, autos and anything else that’s on wheels. McBride’s offers such a diversity of space sizes and types of spaces, customers can get exactly what they want in a parking facility at the price they can afford. Without a doubt, if it’s on wheels, you can find a vehicle storage space for it at McBride’s RV storage in Chino California. McBride’s can provide affordable RV storage because they cater to their customer’s needs. They offer long term RV storage or short term RV storage, which ever type you need. Ask about discounted RV storage if you have a fleet of commercial vehicles or multiple vehicles or trucks that need storage. Don’t ever settle for less! Only at McBride’s will you get your money’s worth. You’re making the smart choice when your choose McBride’s for all your RV storage needs. Check out our covered RV storage spaces if you need full protection for your motorhome or trailer. You will fall in love with this RV storage facility. You will find that all the employees are very helpful and all the design features that make the RV life style fun and enjoyable. Call now for price and availability.